Many SelfHacked readers struggle to tell whether a supplement or device they are trying out is making a difference for their health. Such judgments are often confounded by our own perception and placebo effects. Also, many of us who experience brain fog or subclinical cognitive problems are often brushed off by our healthcare providers. In this post, I’m excited to share with you an FDA-approved technology that perfectly solves these problems. Figuring out whether a supplement or a biohack is working for you will no longer be guesswork. Brain fog and poor cognitive function are real health problems, but neither conventional nor alternative medicine have yet to discover reliable ways to test or address them. On one hand, they can be an early sign of serious diseases, like Alzheimer’s, multiple sclerosis, and numerous mental health issues. On the other, they often accompany chronic illnesses, such as fibromyalgia and hypothyroidism. Every case of cognitive dysfunction is different. In order to identify the causes and treatment, it is important to discern the extent to which certain factors worsen brain function. Since many people with cognitive dysfunction struggle to tell what effect certain foods, supplements, or even chemical exposures have on their symptoms, they end up wasting a lot of money on hacks that don’t work. I have known Dr. Robert Dennis for a few years. I think he is a great person, scientist, and innovator. Dr. Dennis and I previously spoke about the ICES PEMF device, which tremendously helped me and several SelfHacked readers with inflammation. Now, I’m excited that Dr. Dennis and his team were able to create the Brain Gauge, a very sensitive device that quantifies brain function. The Brain Gauge is a small computer-mouse-shaped device with two buttons that can vibrate and detect movements with high resolution. It is so sensitive that it can measure the most subtle changes in brain function. You can listen to our new podcast episode where Joe discusses the Brain Gauge with Bob Dennis here. How Does Brain Gauge Measure Brain Function? The Brain Gauge measures both overall and specific brain function through the sense of touch (the somatosensory system). The somatosensory system is organized so that adjacent regions on the skin project to adjacent regions in the brain cortex. Map of the somatosensory cortex. The hands occupy a large region of the somatosensory cortex, which makes it a sensitive part of the body for testing brain function. Image source R.
When two of your fingers are touched or pulsated, two nearby corresponding regions in the brain become active and communicate with each other. Your ability to ascertain specific aspects of physical sensations, such as vibration intensity, duration, and order, is indicative of your brain’s performance. Brain Gauge measures this to show how well your brain cells communicate. Brain Gauge also measures your brain’s ability to perform lateral inhibition. Lateral inhibition is the capacity of one excited neuron to inhibit the activity of a neighboring neuron. This allows the brain to shut down noise, recognize important signals and patterns, and meaningfully integrate all this information. Lateral inhibition makes it possible to tell apart two close by, but different, stimuli on the skin, or to see two distinct dots of light in the dark instead of one big blur. This ability is highly dependent on the health of the brain and the nervous system. The Brain Gauge tests are in a game format that can be “played” on a computer. The entire battery of Brain Gauge tests takes about 10 – 20 minutes, depending on how fast you are. It can even detect cognitive changes that most brain imaging techniques cannot. It is much more versatile and less expensive for measuring brain function compared to the existing methods. The Brain Gauge score is also called the CorticalMetrics score since it’s a measurement (“metric”) of the brain cortex function. Factors that affect brain function will reduce the Brain Gauge score. Since Brain Gauge is very sensitive to these factors, it will be able to precisely measure how well your brain is functioning. According to one of its creators Dr. Dennis, psychoactive drugs start to change brain function before changes in behavior become overt. Unlike Brain Gauge, most other techniques overlook these subtle changes. Anecdotally, Joe finds that food sensitivities reduce his performance on Brain Gauge within hours of consumption. This is especially the case for lectin-containing foods, such as grains, beans, and nuts. Since lack of sleep or disrupted sleep will worsen cognitive function, it will reduce the Brain Gauge score. Alcohol slows down reaction time and several other brain functions, and can thus worsen Brain Gauge scores. Alcohol consumption affects Brain Gauge scores for up to a week, and may even estimate the amount of alcohol you’ve consumed based on the scores you get [R]. Like sedative medications, sedating supplements may also reduce Brain Gauge scores. Brain Gauge can detect changes in brain function due to concussions even when brain imaging doesn’t detect any structural changes [R]. Improvements in Brain Gauge scores post-concussion, which shows that the subject recovered over the course of two weeks [R]. Therefore, Brain Gauge may be a good objective way to assess the efficacy of both conventional and alternative treatments for these health conditions. Joe personally finds that Hi-Maize and raw honey improve his Brain Gauge scores. Also, avoiding foods that he is sensitive to helps him maintain high Brain Gauge scores. 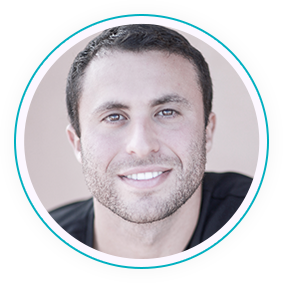 “I haven’t had much luck finding a supplement that helps with speed and focus. I have tried many, but I just felt like I didn’t notice much. I have noticed improvements with supplements for sleep and relaxation, but not for speed and focus. I have found vigorous exercise to be the most helpful, but I don’t always have time for that. When I got the Brain Gauge, I really wanted to test this aspect and see if I can notice a difference in performance due to a supplement. I remember that I felt slightly more focused when I took this tablet with a combination of pyridoxine-5-phosphate (an active form of vitamin B6), methylfolate and methyl B12. I didn’t get it for this purpose, but this turned out to be a beneficial side effect. Many people apply the ICES (our recommended pulse electromagnetic frequency device) to their head, but do not feel anything as the results can be quite subtle. However, the results are measurable using BrainGauge. In a CorticalMetrics study, 8 patients who had suffered lasting symptoms of traumatic brain injuries for years experienced significant improvements in Brain Gauge scores after 1 – 2 weeks of ICES treatment [R]. By improving mitochondrial function and lowering inflammation, Low-Level Laser Therapy or Red Light Therapy on the head may also improve Brain Gauge scores. Caffeine appears to be a conundrum. It improves certain aspects of cognitive performance while hampering others. Moderate amounts of caffeine seem to improve performance, while high doses of caffeine hamper it [R]. My speed and focus were somewhat improved, but my plasticity score diminished. According to the Brain Gauge app, the plasticity score can be lowered by states of hyper-excitability. I don’t know if the caffeine is actually responsible for this or it is just a coincidence, but that reflects why I tend to not like caffeine. Some people may find that performing or listening to music enhances their cognitive function. One of our writers finds that playing guitar before taking the Brain Gauge somewhat increased his performance score. Accuracy score is derived from the amplitude discrimination test. This shows your brain’s ability to perform lateral inhibition, or how well your neurons inhibit the activity of nearby neurons. Speed measures your reaction time and reaction time variability. Reaction time variability is an important measure of brain damage. Adolescents with ADHD also do poorly in reaction time variability [R, R]. Focus measures your ability to focus. ToJ stands for Temporal order Judgement measures your ability to tell if one stimulus is coming before the other. This is a measurement of the fronto-parietal pathways. This score is often low in schizophrenics and dyslexics, while autism and migraine may also lower these scores [R, R]. Timing perception is the ability to discriminate between the duration of two different stimuli and shows how well your cerebellar and parietal cortex are doing. The cerebellum (the movement and balance center of the brain) coordinates between different cortical areas. These scores are usually low in people in Parkinson’s and with migraines [R, R]. Connectivity is how well different parts of the brain talk to each other. Plasticity is how well your brain adapts to the stimuli, which is measured by how well you can distinguish the small differences in two stimuli (amplitude discrimination). Fatigue is a measurement of brain fatigue after mental exertion or how much your performance drops over multiple tests. Corticalmetrics score is a score that takes into account all the scores above using a technique called Principal Component Analysis. It’s an index of overall brain function. The somatosensory system is a better way to test cognitive function because it can more specifically target certain areas of the brain. In addition, because it does not rely on sight or sound, it is less prone to distractions and results in more precise measurements [R]. There are several tools that measure reaction time as a proxy of brain function, but existing tools are not accurate enough. Most of these tests use a visual or auditory beep to trigger the subject to respond on a device. Most monitors and smartphone screens refresh at a rate of 60 Hz, which means the screen only changes once every 17 milliseconds. These software typically take about 2 – 20 milliseconds to respond. Touch screens and mice that require the signal to go through the CPU also introduce at least 35 milliseconds of latency in the reaction time measurement. Therefore, visual and auditory reaction time tests may not be accurate enough to detect subtle changes in brain functions. 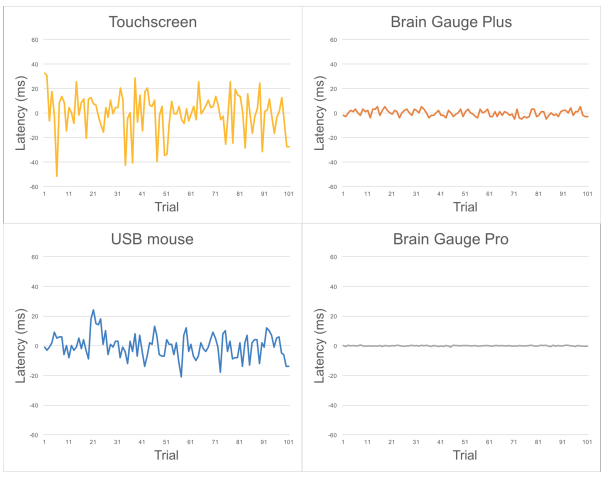 Brain Gauge has its own microprocessor devoted to measuring reaction time of the subject, so the results are independent of the computer and any other hardware you use. This makes Brain Gauge about 1000x more sensitive in testing reaction time than systems that use vision to test reaction time [R]. It can distinguish the differences in reaction time with 0.33 milliseconds resolution. Such precision makes it possible to test for reaction time variability, which is a more sensitive indicator of mild cognitive deficits than the reduction in reaction time after concussion [R]. Mild Traumatic Brain Injuries (mTBI) are usually not detected well with an MRI, which can cost ~$1000/scan. In addition, the MRI is not portable or practical for a quick assessment. The Brain Gauge is much less expensive and can better pick up the subtle changes in brain function than an MRI [R]. ImPACT (Immediate Post-Concussion Assessment and Cognitive Testing) is a computerized test currently used to diagnose concussions, inform treatment, and consider whether an athlete may return to play [R]. Interestingly, the ImPACT scores actually improved the day after the concussion, which suggests that it might not be the best tool to assess concussion recovery. This is possibly because the existing computer devices lack the necessary resolution to precisely measure the decline in brain function. While ImPACT scores typically return to baseline levels within a week, Brain Gauge scores remain below the baseline for up to two weeks [R]. As a SelfHacked reader, you can use code SELFHACKED to receive 15% off your Brain Gauge purchase here. Different foods, supplements, and lifestyle changes can subtly affect your cognitive function, especially if you struggle with brain fog. By using the Brain Gauge, you may be able to identify foods that worsen your performance, or supplements and lifestyle changes that help. This will be extremely helpful for people who don’t usually feel anything from these interventions. 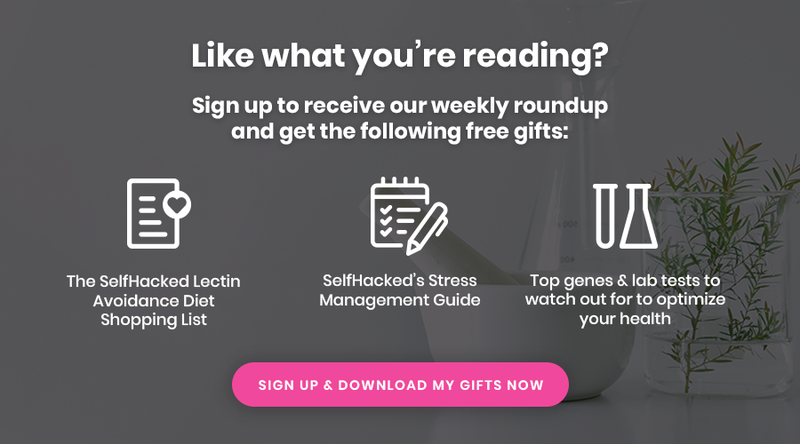 For people who are into nootropics, you can also use it to determine whether the nootropics really boost your brain function. You can use Brain Gauge to determine if devices like the ICES are working for you. In addition, you can also find out if different ICES coil placements change your brain function differently. Cognitive decline may start decades before neurodegenerative diseases become diagnosable. By objectively measuring cognitive function, you can catch cognitive decline and fix it before it becomes a full-blown disease. Most patients with mild traumatic brain injuries have no detectable physical changes in the brain, but many continue to suffer from chronic symptoms of brain inflammation for years. Brain Gauge is groundbreaking because it can accurately detect these symptoms, which allows for correct diagnosis and treatment of traumatic brain injuries. Although pain is an essential indicator of our body’s overall state, there is currently no way to objectively measure pain. This is because pain may originate from complex centers in the brain and not correlate with any physical damage [R]. Existing measurements of pain can be imprecise and loosely rely on the patient’s report and rating. Opioid drugs are prescribed based on these measurements, which has become a huge problem leading to the ongoing opioid crisis. The somatosensory system is directly linked to pain perception. Because Brain Gauge assesses the function of the somatosensory system, it may help measure pain [R]. In a pilot study of 12 women with chronic vulvar pain (vulvodynia), Brain Gauge was able to detect changes in central nervous system function [R]. In the near future, this will allow clinicians to better measure chronic pain and assess whether the treatments are working. Science has uncovered ways to track the most important bodily functions needed to sustain life: heart function, breathing, and body temperature. These are called vital signs. We still do not have a way to track brain function as a vital sign, and Brain Gauge opens the doors to this possibility. Brain Gauge could shed light on overall brain health, using tasks that synchronously engage the whole brain. The brain is extremely delicate: it’s sensitive to stress, nutrient status, oxygen levels, inflammation. It controls hormones and many other systems in the body, which is why brain health is extremely important. Brain Gauge has the ability to measure subtle changes, which could prevent disease and increase longevity [R]. The researchers behind Brain Gauge hope that it will one day help doctors quickly screen their patients’ brain health. Patients could get a “brain profile”, similar to a blood pressure reading. Brain Gauge is the basic model and the least expensive one, made for home use. You will need a mouse or keyboard to respond. This model has a 5-user limit. Brain Gauge Plus is similar to the home-use model, but the device and the software are designed for unlimited users, convenient for clinics or research. Brain Gauge Pro comes with a response capability, which means that you will not need a mouse to respond. It is also extremely sensitive, being able to detect movements as small as one micron (1/100th the diameter of a hair). This model is made for research use. Use code SELFHACKED to get 15% off. Too bad it doesn’t work with the subscriptions; suppose that’d be too much to ask. I see no place on the checkout to provide any discount code. If you are asking for more technical info, such as schematics and design of hardware, software, we don’t provide that. The hardware is the result of almost 15 years of cramming about `100 lbs of $50K worth of laboratory grade research equipment into something the size of a computer mouse. The software is made up of over 3.2 million lines of code. This has been in development a long time, and we suspect that it would be rather difficult for someone to quickly and easily duplicate.